Advance registration only. No onsite registration. Round times: 9am then ASAP. K-2 and K-5 will finish no later than 1pm (often significantly sooner). The K-12th grade section will finish at approximately 1:30pm. *Players in grades K-5 may join the K-12 section ONLY if their official rating is 1000 or above. *No byes permitted in the K-12 section. Players are expected to play all three rounds. 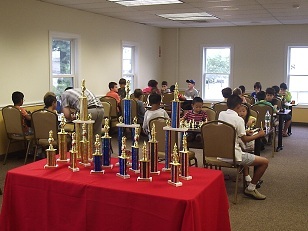 Trophies for 1st - 5th place in each section.